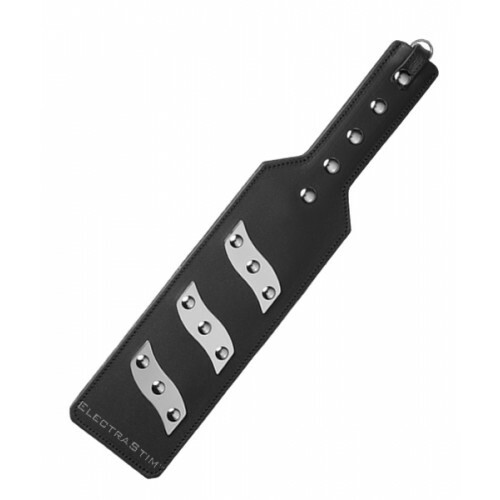 The ElectraStim ElectraPaddle Electro Spanking Paddle. A high quality smooth black leather spanking paddle for electro stimulation play. Three electrode plates produce a variety of contact option and stimulation patterns. It's a bi polar electrode that can also be used as a uni-polar electrode with other attachements. Use with the ElectraStim Flick units to create rythmic electro stimulation and intensity in tune with your strokes. It measures 13.25" overal length with a 9" paddle length. Made from genuine leather with stainless steel contacts. Recommended use with electroconductive gel.